See these ValueMags magazine subscriptions with free shipping. Since Valentine's Day is over, it's only natural that we should rush right into the next holiday, right?! It's crazy that the stores have already stocked up on Easter decor and goodies...but I'm not about to let St. Patty's Day pass on by. Oh no...when you have a baby, every holiday counts! Besides, I really love the color green...it's my favorite! And crisp and fresh greens seem like the perfect palette to introduce this new season. So above, is a preview of all things that I'm loving for the baby. Of course, you know I've got the boys dialed in, but I shrieked a little seeing all the cute girl things out there. Those skinny jeans and peplum top? I die. By the way, I'm linking up to Trendy Tot Tuesday today. It's a cute new series that some of my favorite mommy bloggers put together. Hop on over for some stylish ideas for your little ones. PS...I'm over at Meet the Sullivans talking about my diaper bag essentials...check it out here! Dying over the cuteness! Green is my favorite color too! Ahhhh! green is my favorite and being Irish, we are all about rocking the green for the next month! Love that outfit for Riley! So cute! I must check out those green loafers! 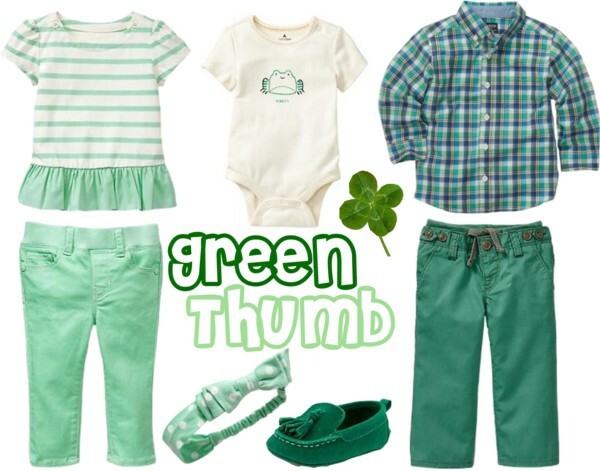 I've been eying all of the girl picks for weeks now- love love love your selection here girl :) I wish Scarlett were here for St. PAtty's day this year, but I guess we'll have to wait and have our lucky charm here next year! just bought B that striped green top from baby gap last week. great minds think alike! I really like the little green shoes! They are so stylish looking. I can't keep up with all these holidays! Although I am doing Easter outfits of course. Skinny jeans ARE just too cute - but cute on boys too. Max looks GREAT in his skinny Gap jeans (but he is also skinny so maybe that's why they look nice - and actually they don't look "skinny" on him, they just actually fit him).